Explanation: Night skies over Chilean mountain top observatories can be dark and clear, with glorious cosmic vistas. In this recent example, the plane of our Milky Way galaxy stretches parallel to the horizon, the galactic center's star clusters, dark dust clouds, and glowing nebulae hovering in the west. 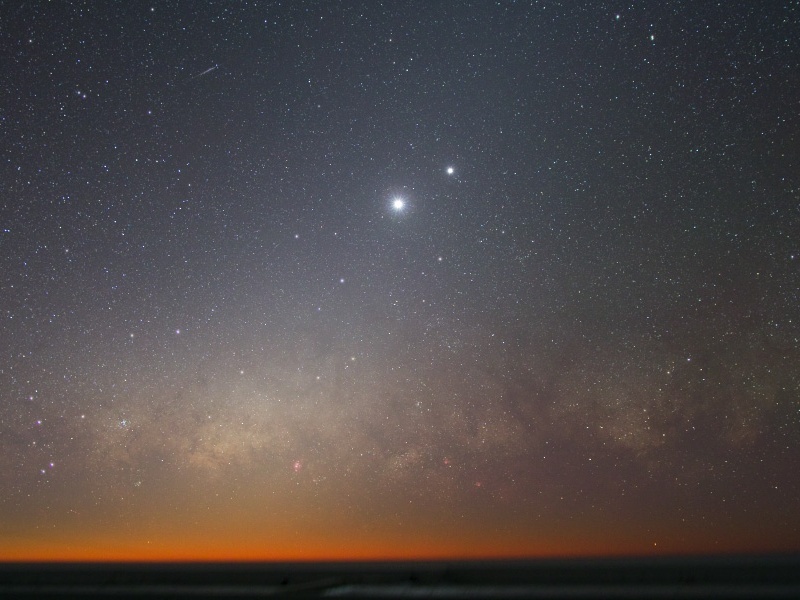 Recorded after sunset, the wedge of light extending upward through the scene is Zodiacal light, sunlight scattered by dust along the solar system's ecliptic plane. A faint meteor was also caught in the view, but approaching a conjunction, brilliant Venus and bright Jupiter dominate the skyscape. A close pairing through this weekend, by Monday, December 1, they will be joined by the young crescent Moon. Look west after sunset and the tight celestial triangle formed by Moon, Venus, and Jupiter, the three brightest beacons in the night, will be a spectacular sight, even from bright-sky urban locations all over the world.